If you operate on social media, it is imperative to be aware of how your competitors market and how your performance measures up. Performing a social media competitive analysis doesn’t have to be hard. This post will make the job easy, and our template will help you look amazing. To help you with your analysis, we’ll walk through an example of creating an entire competitive analysis. Our example brand for this walkthrough will be the makeup brand essie, and we’ll use a set of 7 other brands from the beauty landscape as the comparison set for our analysis. To set you up for success, here are a few essential items to get started. Before we get started, get a copy of the template to play along. These templates are free to download and use, and there’s no form to fill out. Download the Keynote version of the template. Download the PowerPoint version of the template. Download the PDF of the essie sample report. Now that you have your template ready to go, let’s get started! This template and analysis guide are in-depth. To find the specific part, use this table of contents to skip ahead to any section of the report. To complete our social media competitive analysis, we’re going to need a data tool to help us gather the information we need. There are a number of tools you could use to perform this analysis, and we’ll use Rival IQ to do most of the work. If you want to play along at home, our 14-day free trial will let you do everything you need. You’ll also want to make sure you get a copy of our template so you can work through your analysis. The first step in completing a competitive analysis is building a set of competitors. Of course, you probably know who your key competitors are, but in case you don’t, here are a couple of ideas for finding some comparisons. Use SimilarWeb to find competitive websites. Google search your brand name to look for other companies advertising against your brand. Google search your main product to look for other companies. Use your profile page on Twitter to look for recommended other accounts to follow. For this example analysis, we’re going to focus on essie, “America’s Nail Salon Expert. Since 1981.” The competitive set for this analysis includes 7 other beauty brands, including Tarte Cosmetics, Urban Decay, and Lush. The competitive landscape for our example analysis. Now that we have our competitive set, we need to determine which channels to include in our analysis. Using the data from our landscape, we’ll review average performance for audience (fans), activity (posting frequency), and engagement to determine where to focus. For the rest of this example, we’ll perform our analysis using a 4-month time period of data. We’d recommend using at least three months of data. Of course, using less will work, too, but keep it to at least 30 days worth of data. Let’s start with some average audience and audience growth metrics. Here, we’ll be able to see which social channels have the largest followings and are showing strong growth. 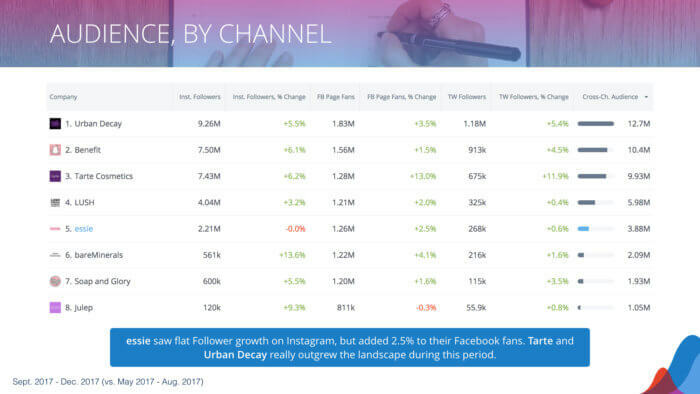 Looking at the average follower counts for these companies, it is easy to see that Instagram is the dominant channel, with Facebook coming in second. Considering follower/subscriber growth, this landscape is seeing 4.6% monthly growth on YouTube (20% over the 4-month period we’re analyzing). Outside of YouTube, Instagram, Twitter, and Facebook are all seeing similar growth (about 3% to 5%). Try it: To perform this analysis, we use the Cross-channel Landscape Comparison report in Rival IQ. 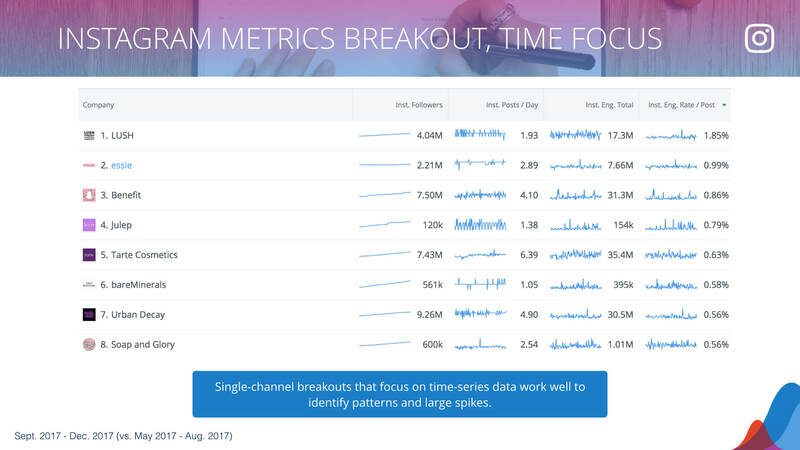 We can use activity metrics to understand where our brands are investing their time. 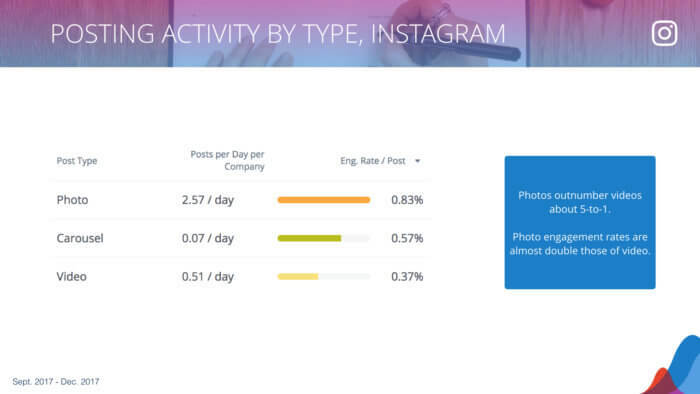 In the slide below, we can see that Instagram (3 posts / day), Twitter (2.6 posts / day), and Facebook (1.5 posts / day) get substantial ongoing investment. Pinterest also sees about 1 post / day, but further digging will reveal that averages sometimes hide outliers. In this case, Tarte and Lush posted to Pinterest a ton during this report period. YouTube is a different beast, and we wouldn’t expect to see posting volumes that rival the other social channels. Still, on average, the average brand in this landscape is posting more than one video a week. The channels that matter for this landscape: All of them! Clearly, beauty brands cover their bases and invest time in every major social platform. In this example, we’ll use Instagram for our single-channel analyses. In your work, you’ll want to include an analysis of each channel that matters to your business. A review of the language you and your competitors use to describe your brand will inform how you craft and refine that positioning. Each company definitely has a unique way of describing itself. Some companies are better than others in the consistency of those messages. One aspect of positioning that is VERY important is making sure your topline messages are consistently communicated, meaning who you are and what you do are clear and consistent across all digital channels. This is also true for visual branding, which should be consistently employed. Let’s pull in the social bios from this landscape to do a review. We’ll look at each bio for each company, channel by channel. Try it: To perform this analysis, we use the Cross-channel Positioning Report in Rival IQ. Starting with Instagram, we’re looking for a few key items beyond which words these brands use to describe themselves. Specifically, we’ll examine length, hashtag usage, emoji, and references to other platforms. Starting with length, most of these brands are using more than 100 characters, with Urban Decay and essie using about 150 characters. bareNaturals is sparse with their words, coming it at only 52 characters. The limit is 150 characters, so you can’t go too crazy on the length. Try it: To perform this analysis, we use the Cross-channel Bios report in Rival IQ. On hashtag usage, every single brand in our landscape is using a hashtag in their bio except for Urban Decay. These brands want users to use their core brand hashtags, and putting it into your bio is a good way to let your fans know what to do. Half of the companies in this landscape ask their fans to tag them, including essie. Next, let’s look at emoji usage. 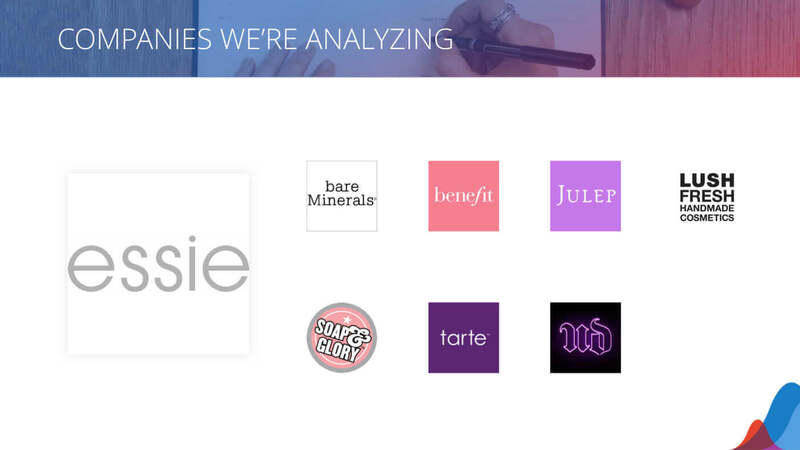 Only 4 of the 8 brands we’re examining are using emoji, include essie. Interestingly, there is no overlap in the emoji that each brand is using. Soap and Glory is going for it, with 5 different emoji in their bio. OK, I guess that 5 emoji really isn’t “going for it,” but they’re “leading” this category. As for references to other platforms, only 2 of the 8 companies in this landscape reference their handles/presences on other platforms. Both Tarte and Benefit reference Snapchat, and Tarte also references Musical.ly. In the next slide, we performed a word frequency analysis using the bios from Instagram, Facebook, Twitter, YouTube, and Pinterest for the companies in this landscape. A word frequency analysis looks at how many times a word is used in a set of text. You can do this analysis using a free tools like WordCounter or a word cloud generator. Not surprisingly, the words “beauty,” “product,” and “cosmetic” are all heavily used in this landscape. If you want to see the Facebook and Twitter positioning slides, check out the report. Try it: To perform this analysis, we extracted the text from the Positioning CSV export in the Reports dashboard in Rival IQ. To understand how these brands compare on social, let’s dig into a variety of metrics around audience, activity, and engagement. For each type of metric, we’ll start with some cross-channel analysis and then get into some single channel analysis. To begin, let’s look at cross-channel followers and follower growth for this landscape. Cross-channel audience with growth performance. For this landscape, it’s clear to see that Instagram constitutes a large percentage of the followers. From the landscape averages slide we analyzed previously, we knew this would be the case. The range of audience sizes runs spans more than 10X, from the smaller Julep at 1.05M to Urban Decay at 12.7M. 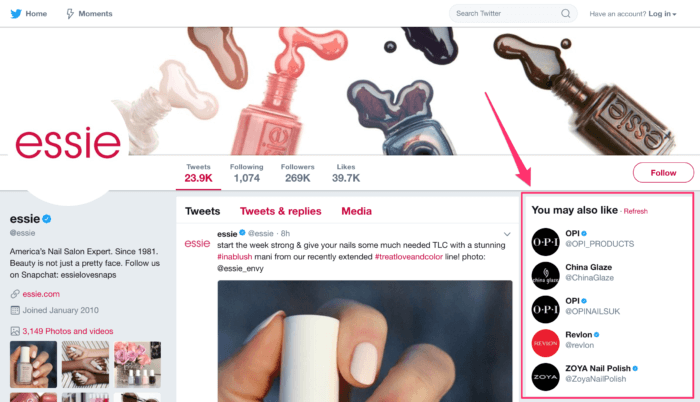 essie comes in on the smaller end of this range with 3.88M followers across the six networks. 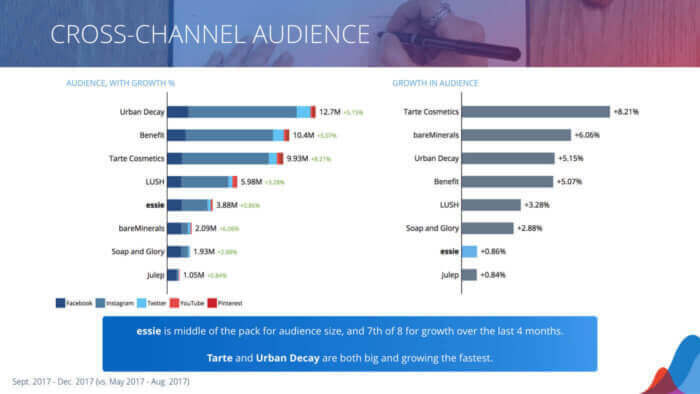 Though every company showed growth over the four months we’re analyzing, Tarte and Urban Decay turned in particularly large growth numbers, especially given their size. Try it: To perform this analysis, we used the Cross-channel metrics report in Rival IQ. Breaking our audience metric down by channel gives us more visibility into per-channel growth for each of these brands. The things that stands out most from the following slide is that two of the brands with the largest audiences also posted some of the highest growth numbers. Meanwhile, essie’s Instagram following was flat during this time period. Try it: We built this by-channel table using Custom Dashboards in Rival IQ. Producing content for social media is a time consuming endeavor. Posting the right amount of content, and posting consistently, is hard work. Examining cross-channel posting activity gives some insight as to how much these brands are investing into each channel. In this landscape, we can see that there is a broad range of posting volumes. essie is one of the highest volume producers, and their volume is consistent with the previous 4 months. 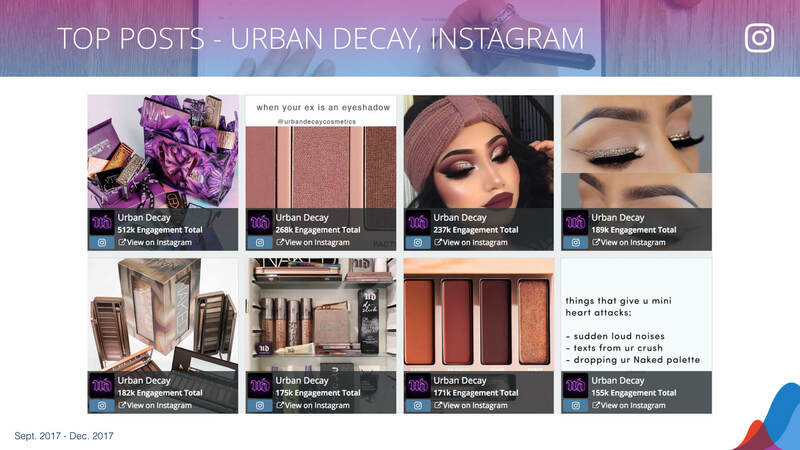 Tarte Cosmetics publishes more than 2x the next brand, Urban Decay. This large volume is partly driven by their large output on Twitter. 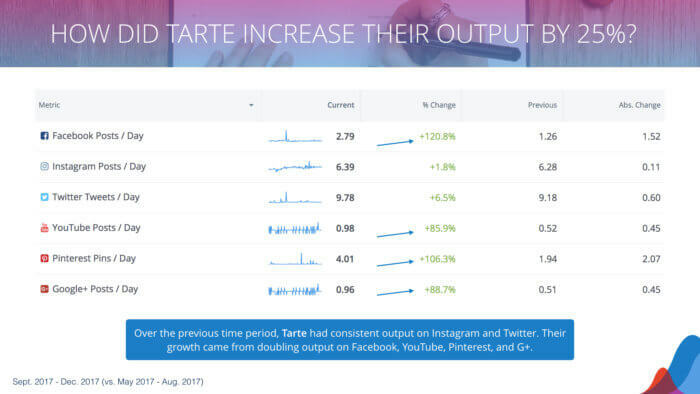 During this time period, Benefit and Tarte both increased their posting volume by about 25%, a substantial increase. Let’s dive deeper to understand how these cross-channel metrics look on a per-channel basis. Tarte more than doubled their Facebook output during this time period, though that can’t really explain the entire amount of their growth. The table below is only showing a breakdown for Instagram, Facebook, and Twitter. 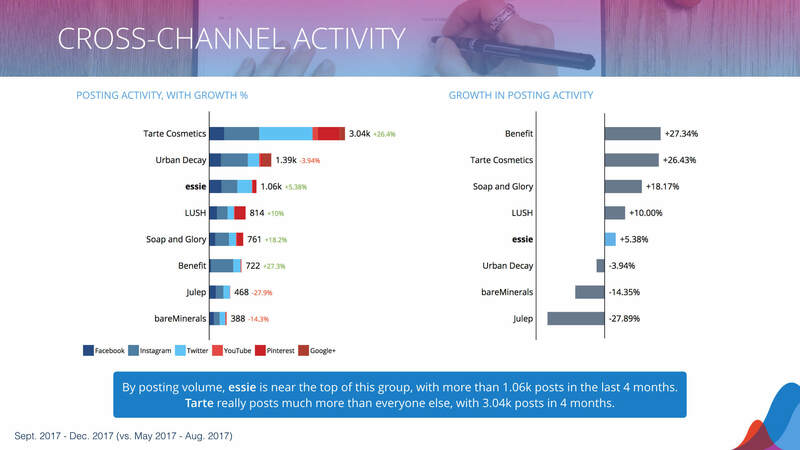 Digging in, we can see that Tarte grew their overall posting volume by almost doubling their posts on 4 channels: Facebook, YouTube, Pinterest, and Google+. You might also notice the spike in activity on Facebook and Twitter during the first third of this time period. That flurry of activity was from their #stormoflove fundraising campaign. 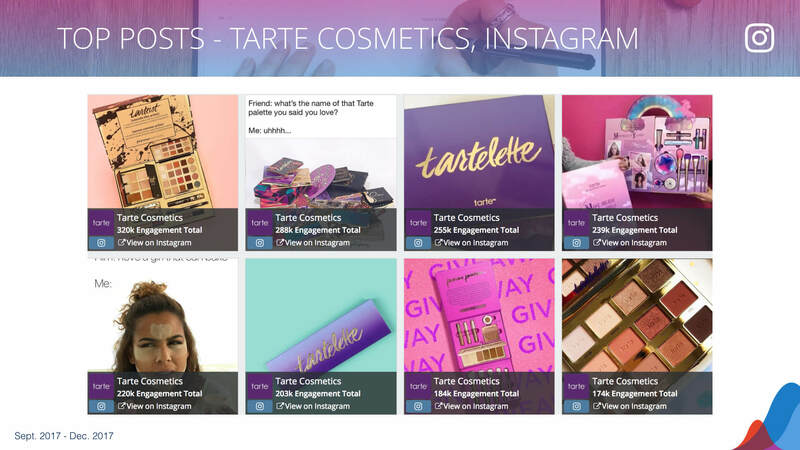 A deep-dive on Tarte’s posting activity across all six channels. The real key to understanding social media performance is understanding engagement. If you aren’t publishing content that resonates with your audience, you aren’t making the most of the potential of these powerful platforms. To start our engagement analysis, we’ll look at total engagement on a cross-channel basis. In the slide below, we see that Instagram is the overwhelming majority of engagement for this landscape. Tarte, Benefit, and Urban Decay all bring in a massive amount of engagement on their posts with more than 31M engagement for each of them during this time period. Of that group, Benefit also grew their total engagement by more than 30% from the previous time period. Of course, Instagram is a huge engagement driver, but breaking down the total engagement for a few of the other channels gives us more insight into the social performance of these brands in other places. In the slide below, we get a breakdown of total engagement and total engagement growth on Instagram, Facebook, and Twitter. 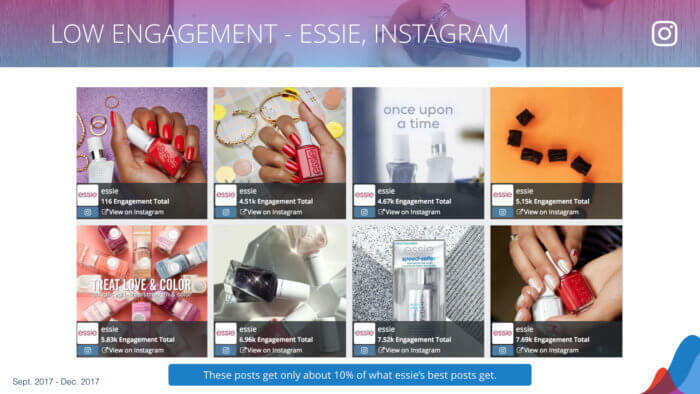 We can see that essie kept their Instagram engagement steady from the previous time period and managed to grow their Facebook engagement by 92%! Of course, just looking at total engagement doesn’t give us the complete story. To understand more about how posting volume is driving these numbers, we need to study total engagement per post. 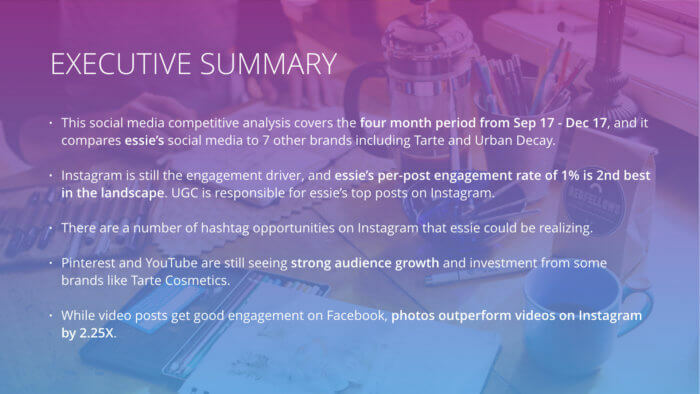 In the slide below, we get a channel breakdown of total engagement per post on Instagram, Facebook, and Twitter. Now, we can see that essie’s growth in Facebook total engagement (92%) was due to an increase in posting. They did increase Facebook engagement per post by 13%, but posting more while keeping your per-post engagement content will increase your overall engagement metrics. It is also interesting to note which of these brands decreased their per-post engagement on a per-channel basis. 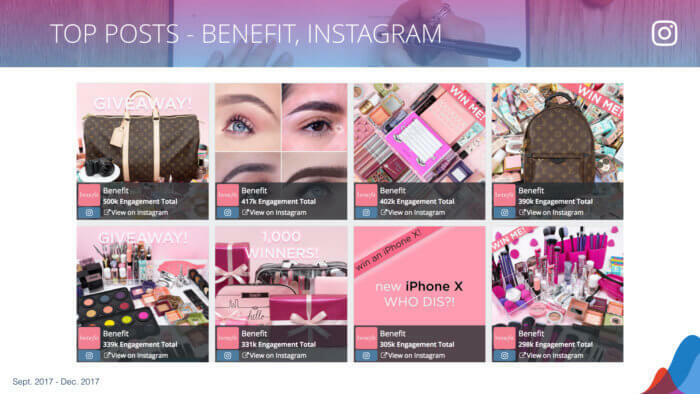 Here, we see that set includes Tarte, Urban Decay, and Soap and Glory on Instagram. Each of these brands have different audience sizes on these platforms, so to examine engagement on a more level playing field, we can use engagement rate per post, which considers engagement per follower per post. In this way, we can get a more equal measure of content resonance. In the slide below, we can see that essie is in the top 3 for cross-channel engagement rate per post, and their Instagram engagement rate per post of 1% is in the top 3 as well. LUSH is really doing well on Instagram, with an engagement rate per post of almost 2%. A single channel breakdown is an important part of any competitive analysis. You’ll gain more insight by examining the interplay between audience, activity, and engagement metrics for a single channel. For this example, we’ll dive into Instagram metrics. For your actual analysis, don’t forget to include all your key channels. In this first slide, we’re examining the followers, posts per day, engagement total, and engagement rate per post, with one row per company. The table is sorted by posting volume, from most to least. essie posted about 3 times per day during this time period with an engagement rate per post of about 1%. 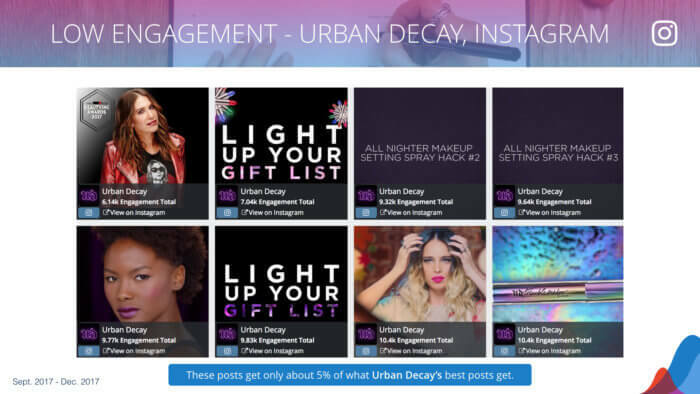 The two brands that post the most, Tarte and Urban Decay, have among the lowest per-post engagement rates. They do, however, top the list for total engagement. If you are interested in discovering patterns or spikes in the data, then using sparklines to visualize large amounts of data can be very helpful. In the next slide, we are looking at the same metrics from the previous slide, combined with sparkline visualizations, to find anomalies or patterns to research. 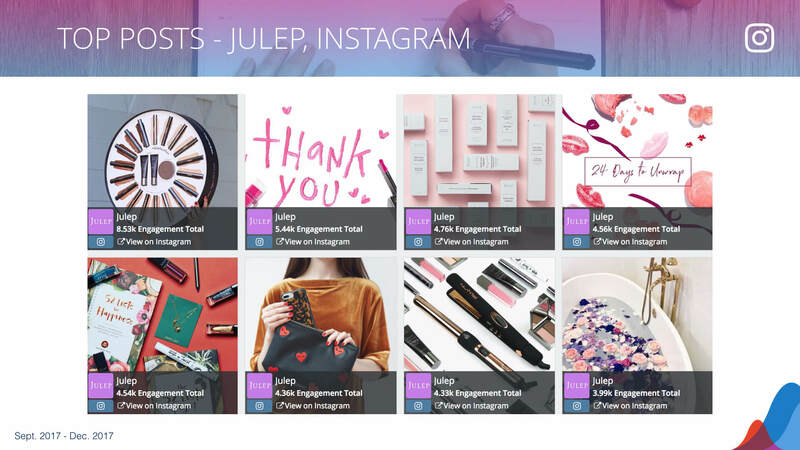 For example, you can see that Tarte posts an incredibly consistent amount of Instagram posts every day, while Julep clearly has a weekday / weekend pattern. How does your brand post? Now that we’ve reviewed metrics, let’s focus on some of the details and the actual posts that drive the metrics. Because this landscape is dominated by Instagram engagement, we’ll focus our analysis on the visual content more than the text of the posts. Both are certainly valid ways to examine the content. To look at the top performing posts from a competitive perspective, it is easier to see what a brand is working toward if you analyze the posts one company at a time. Also, researching a brand’s best and worst performing content will give you insights into what works well, regardless of brand. To begin, let’s start with our focus brand, essie. Below, we’ll see their top 8 Instagram posts during this time period. Each of the top 8 posts clearly comes from the same visual shot style and framing – tight crop, featuring the product, and nails wearing that exact shade. 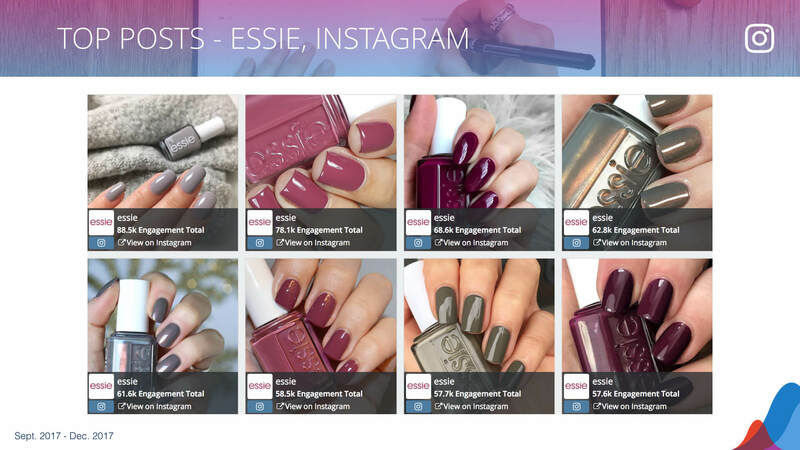 This content really works, and the essie team gets a ton of engagement from these shots. Remember, it is important to dig into what these posts are. 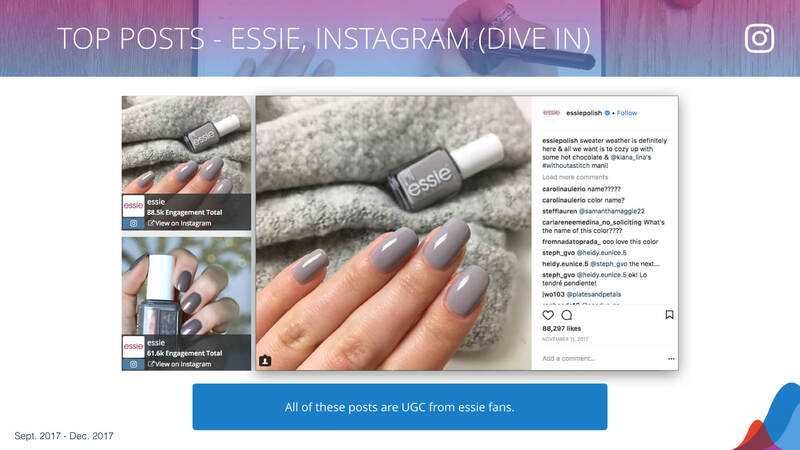 A peek at each of these full posts reveals that they are all user-generated content being shared by essie! Try it: To perform this analysis, we used the grid view for Social Posts in Rival IQ. Essie’s top instagram content is all user generated. Looking at top performing content is only half of the story. Finding patterns in the content that doesn’t get engagement also yields clues as to campaigns that could be improved. 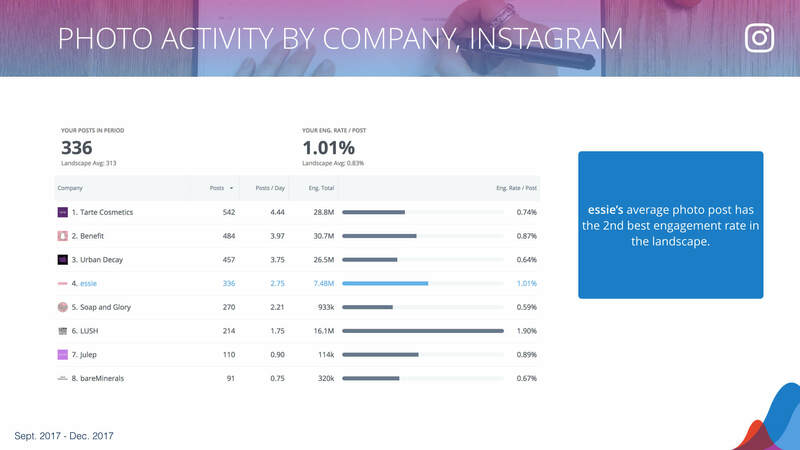 Below, we see essie’s eight lowest engagement posts on Instagram during this time period. These pictures have a very different look than their best performing content, including more words on the pictures, lack of hands, and less of a tight crop on the subject. Though we won’t dive into each company, here are a few more top and worst performing examples. Hashtags help users on social media find content related to a specific topic or theme. Brands also use hashtags to help users show their affection or affinity to a particular campaign. Using the right hashtags also is important for helping users that aren’t in your audience discover your brand. 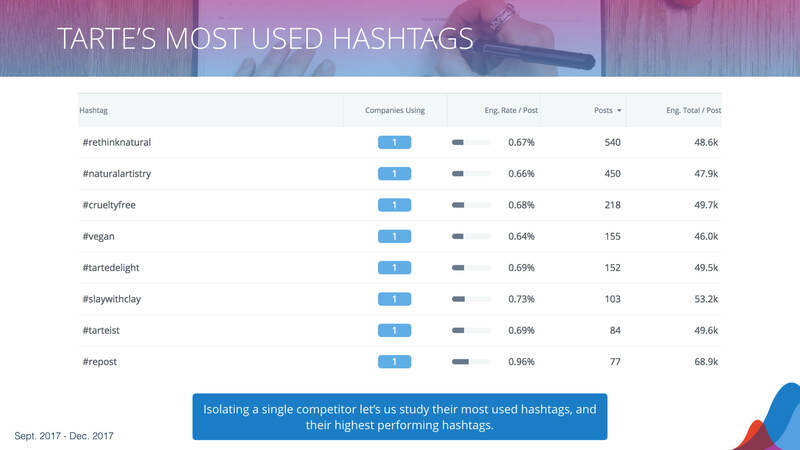 In performing a competitive hashtag review, we’re looking to understand how content using different hashtags performs and to learn if there are hashtag opportunities we’re missing. Also, studying hashtags can reveal competitive insights about campaigns our competitors are running. To start, let’s look at the most broadly used hashtags on Instagram by the companies in this landscape. For this time period, #Halloween was used by 6 of the 8 companies, including essie. Together, they had an average engagement rate per post of 0.5% which is below the landscape average engagement rate per post of 0.75%. Note that among the most broadly used hashtags, #WIN and #giveaway have engagement rates per post higher than 2%! Try it: To perform this analysis, we used the hashtag detail report in Rival IQ. To understand which brands are using these hashtags and how they’re performing, we can expand our view to breakdown the per-brand performance on any hashtag. Digging into the #Halloween hashtag, we can see that Urban Decay, Tarte, and Soap and Glory went all in, with 19 posts each. If we have a specific competitor brand that we want to dig into, we can examine their most used hashtags for insights. Below, we see Tarte’s most used hashtags for the time period. 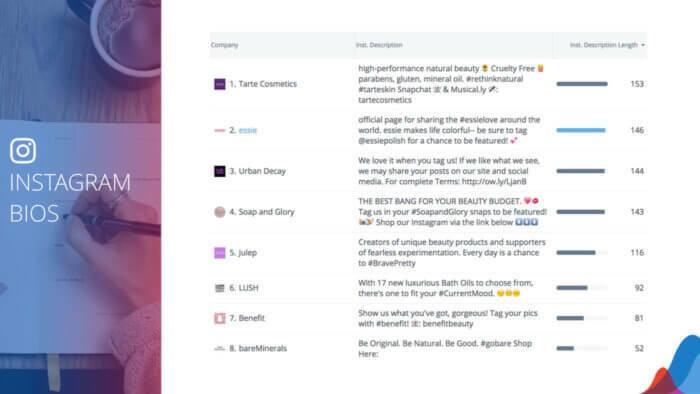 Their most used hashtag is #rethinknatural, with 540 posts. 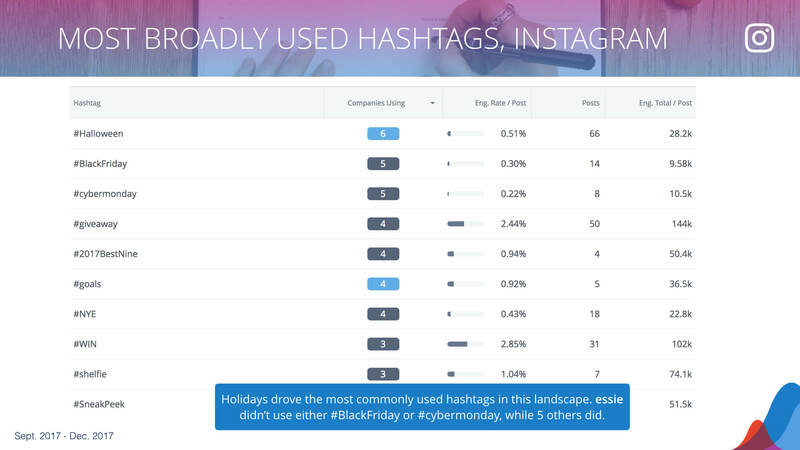 Of their most used hashtags, #repost has the highest engagement total per post. One thing to include in your hashtag analysis is an examination of hashtags that are widely used in your landscape but that you’re not using. In the slide below, we see that essie didn’t use #BlackFriday or #cybermonday while five other competitors did. Looking through the list, it seems that neither of these hashtags was above average for this landscape. 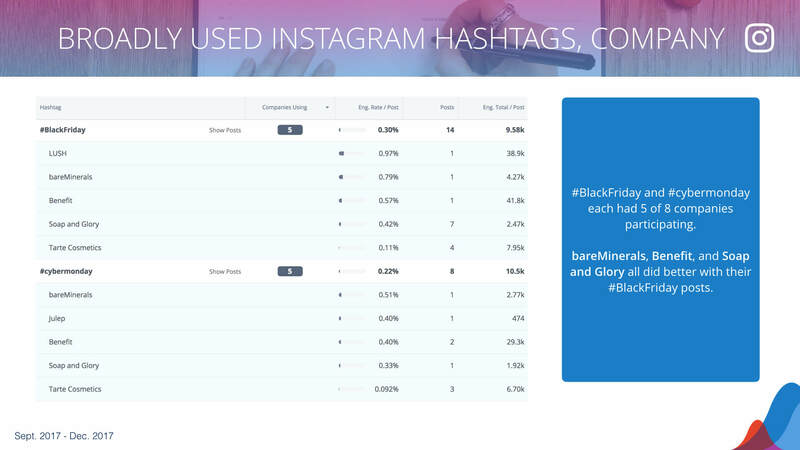 Also, the #BlackFriday posts had higher engagement than #cybermonday. Of course, Instagram isn’t the only place hashtags should be a part of your social media execution. Hashtags on Twitter are critically important, and even Facebook has hashtag support now. 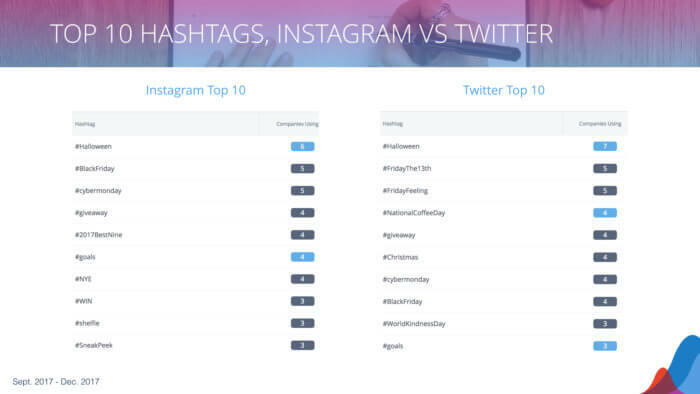 The slide below shows the difference between the top 10 hashtags for this landscape on Instagram and Twitter. The types of content that you post to social media matter. Depending on the platform, the topic, and the audience, you’ll want to ensure you’re posting the right mix of content. One sure way to understand how your post types affect your engagement is to break down your analyses by post type. We’d urge you always do post type analyses on a channel-by-channel basis. No two platforms are the same, and mixing channels in your analysis will lead to confusion in your analysis. Below, we’ll look at a post-type breakdown for Instagram posts by this landscape. The first thing you’ll note is that photo posts outnumber videos by almost five-to-one. 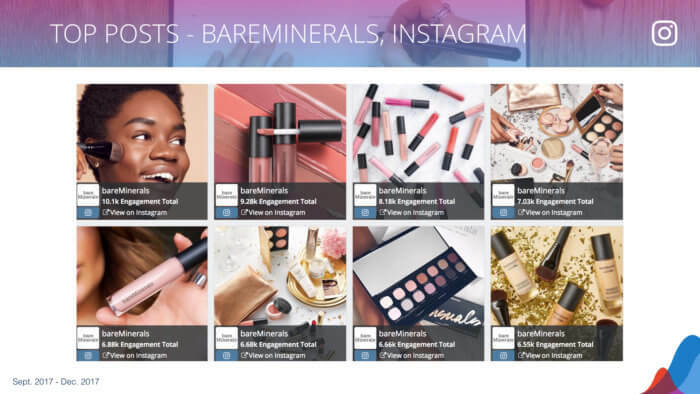 The per-post engagement rates on photos are about 2.25x better than on videos, so it isn’t surprising that these brands aren’t posting as much video on Instagram. Try it: To perform this analysis, we used the post type panel in Social Posts in Rival IQ. To compare how each of the brands perform for each post type, we can focus our analysis on just one single type. To start, we’ll analyze just the photo content on Instagram. In the slide below that examines only photo content, we can see that essie outperforms the landscape average in two ways. First, they post more photo content than the average brand in this landscape. Second, their average engagement rate per post, at 1.01%, is about 20% higher than the landscape average of 0.83%. 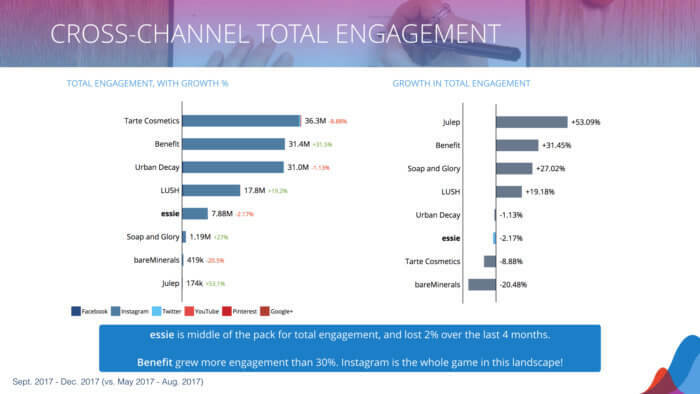 Focusing on only video in the slide below, we see that essie posts fewer video posts than any other brand in this landscape. 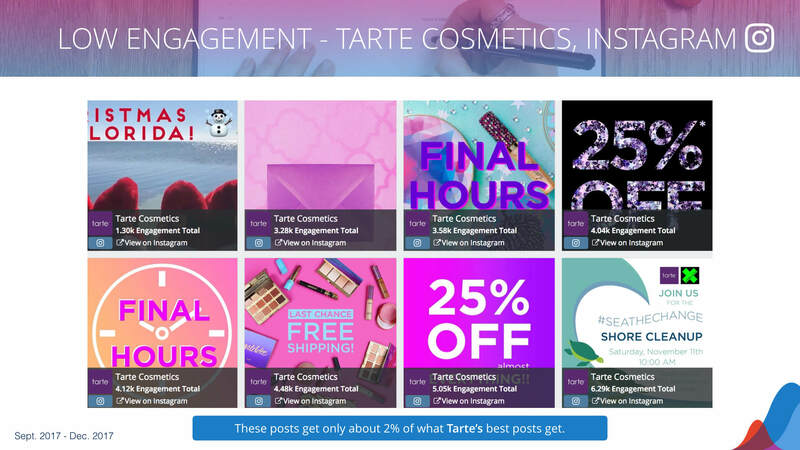 On the other hand, Tarte posted an impressive 226 posts during this 4 month period, almost two posts per day. Their engagement rate per post of 0.38% is about half that of their photo posts, which comes in at 0.74% per post (see above slide for numbers). 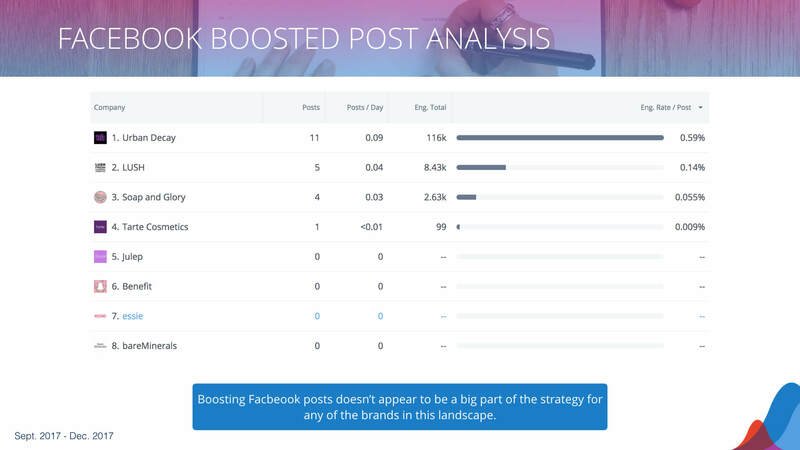 We can gain powerful insights by understanding how often our competitors are boosting their Facebook posts – and the topics they’re boosting. Using a tool like Rival IQ, we can analyze these boosted posts to see what really matters. 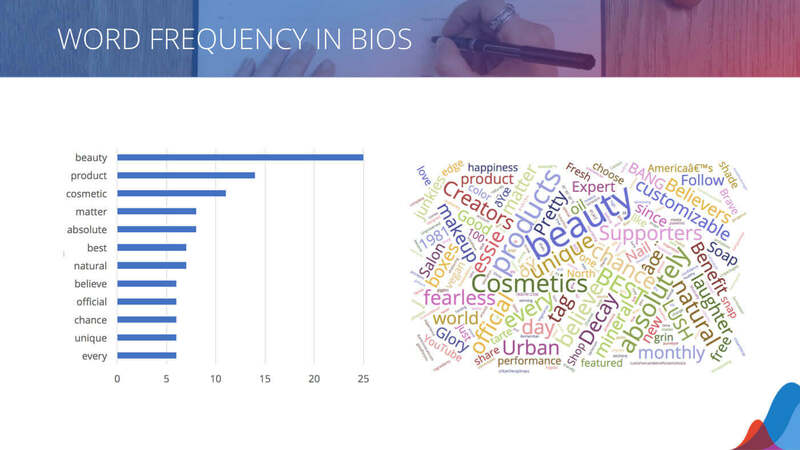 In the slide below, we see that only half of the brands are even boosting posts on Facebook. Considering that this is a four month period, it appears that none of these brands are boosting posts on Facebook in any meaningful way. With 11 posts in 4 months, Urban Decay posted the most. essie, along with Benefit, bareMinerals, and Julep, didn’t boost any posts during this time period. Try it: To perform this analysis, we used Social Posts with a likely boosted filter in Rival IQ. 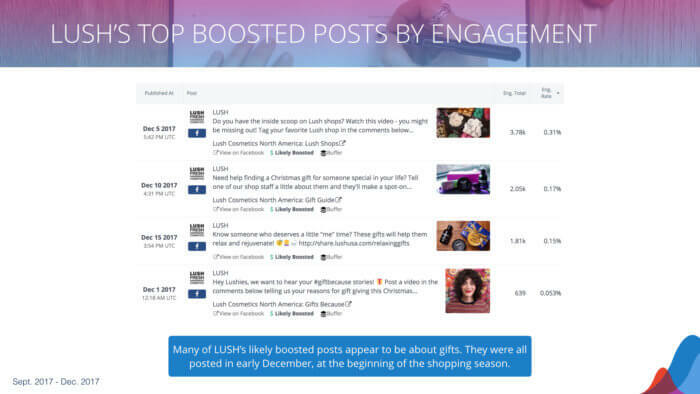 Below, we get a peek into a few of the posts that LUSH likely boosted. Each of these posts earned substantially more engagement than LUSH’s other Facebook posts during this time period. Looking at the posting dates, each of these posts were published in early December and focus on gifting. We can use some lightweight listening on Twitter to learn about who is talking about the competition and how much they’re talking about them. 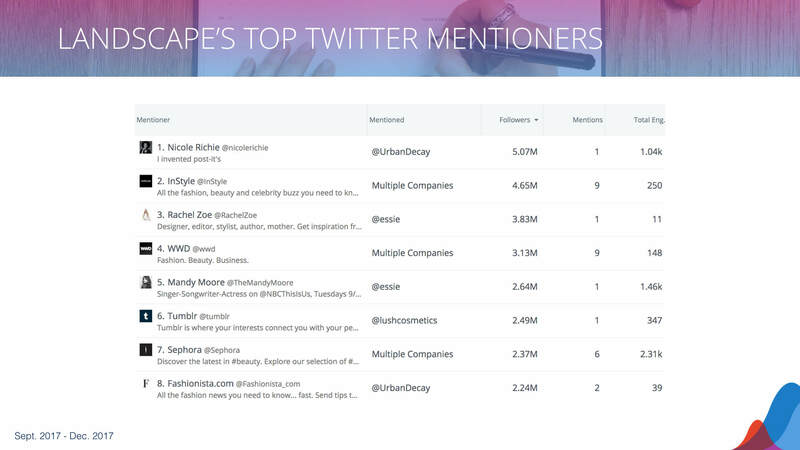 Influencer marketing, PR, and hashtag campaigns are all ways that we see Twitter Mentions really move for a brand. In the slide below, we’re examining the relationship between a brand’s Twitter audience and the number of Twitter mentions they earn. 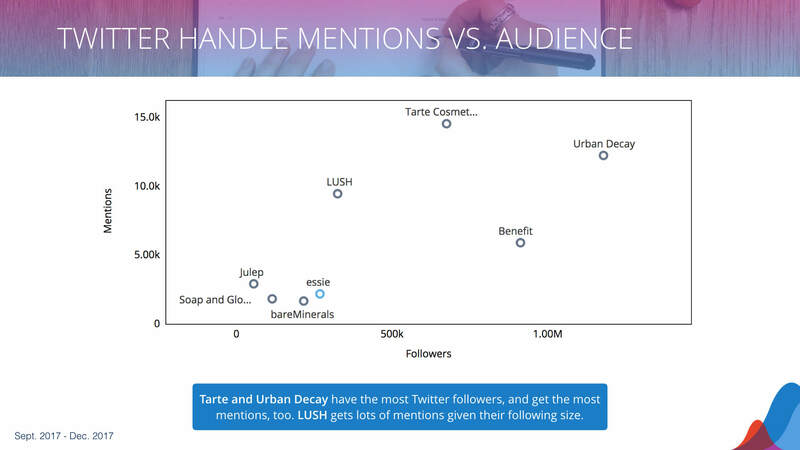 Urban Decay and Tarte have the largest among the largest followings and earn the most mentions. LUSH, despite their smaller Twitter audience, earns an outsized number of Twitter mentions when compared to this landscape. To learn more about the people behind these mentions, we can dig into the actual handles doing the mentioning. In the slide below, we’re looking at Twitter accounts that have mentioned these brands over the time period, sorted by audience size. Nicole Richie tops the list with her one mention of Urban Decay. Sephora, the retailer, had six mentions of a variety of brands in the landscape. Who mentions these brands and how often? Try it: To perform this analysis, we used the Twitter mentioners report in Rival IQ. Before you finish up and share your results with your team, do everyone a favor: put together an executive summary. Describe the analysis, draw attention to key insights from your research, and highlight next steps. This should help the rest of your team determine where they’d like to dig into your report most. You can use Rival IQ’s powerful social media analytics to complete every part of what you’ve learned in this article. We offer a 14-day free trial, and we promise you’ll learn a ton about your industry along the way. Get after it! Get your own competitive analysis using Rival IQ.